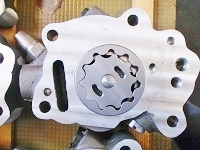 We have developt an oilpump in Sweden. It's made for Harley Davidson Flat Heads from year 1937. It substantialy raises the capacity of the engines lubricate system. The engine run smoother, it endure more and can handle bigger power without problems. 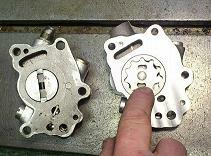 The oilpump ready for assembly. CHP's oilpump at engine here 1 or here 2. Price excluding VAT and transports: $599.